“The Wisconsin Dells surely is a place filled with adventure! I haven’t been to any other town quite like it. The pure assortment of unique places to go and things to see made it the perfect location to start my first travel blog. I mean, along with the opportunity to look at the beautiful dells rock formations along the Wisconsin River, where else can you go and see replicas of a Mayan temple, the Trojan Horse, as well the White House turned upside down — all on one stretch of road!” This was Chris Dearman’s response when asked what makes Wisconsin Dells so adventurous. Chris Dearman is a very talented writer landing pieces in USA Today, The Chicago Sun-Times, The Elgin Courier, The Daily Herald, The Northwest Herald and The MidWeek. He is also a published author of the book “Santa’s Village Gone Wild.” After living in Illinois and Florida, Dearman settled in Wisconsin Dells of all places. But after his above description of the Dells, who can blame him? Dearman has experienced things both locals and tourists alike never will. But others can learn some of his insight as well just by visiting the various attractions while here in the Dells. 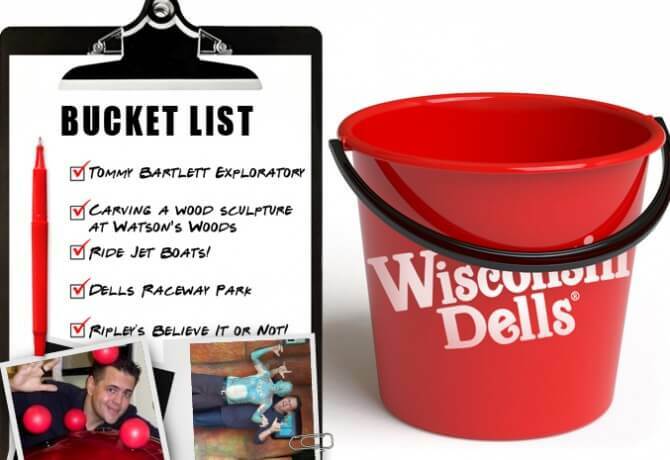 Check out his blog at www.dellsbucketlist.com and keep your eye on dells.com for exclusive offers to many of the restaurants and attractions on Dearman’s list.